Facebook fan pages have been an effective, easy-to-use tool for many small businesses and handmade sellers. Not only is Facebook a widely-used social media platform, but business owners have an existing high level of familiarity with it due to their own personal use. Fan pages allow businesses to engage and interact with their customers. Every post, link or comment response is one more representation of their brand. Facebook also allows users the option to post, link and comment as their fan page throughout Facebook and not just on their fan page. This is helpful because posting as your page can increase brand awareness and also help to drive traffic – andÂ Likes – to your fan page. Users canÂ even alternate between using Facebook at their page or as themselves. 1. 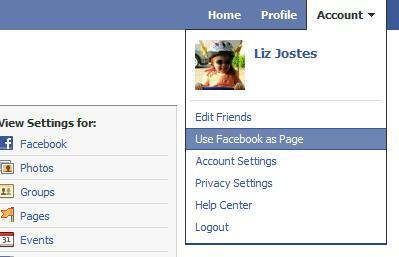 In the drop-down menu under Account in the top right corner of the screen, choose “Use Facebook as Page” from the list. These 2 easy steps are all that’s needed for a person to act as their business while commenting, posting and linking on Facebook. Small business and handmade shop owners have the opportunity to extend their brand’s reach by choosing to interact on Facebook as their fan page instead of as themselves. I didn’t even know this option was available, this will make it much easier to manage my page. Thanks! So, just to clarify- if you switch to your fanpage, it will reach both your fans AND your friends? No more posting once as myself and another as my biz? Correct. You could be using FB as your page, and comment on your neighbor’s wall as your brand instead of commenting on your neighbor’s wall as you. Each comment that is left as your brand is one more exposure people have to you and your site. 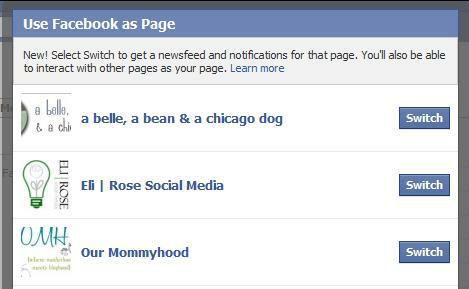 I was really reluctant to have a facebook page for my blog until I realised I cold do this. Now I follow lots of other fan pages as “The Crafty Mummy” and comment on them, without using my personal account. I’m not sure I understand this as yet, but I’m going to try it. Ok I thought this was new. But I was doing this before. You can switch to interact with brands from your fanpage, but you have to switch back when you want to interact with your personal page. Such hassle. There are extra steps involved, but it’s a nice option. Also, some small businesses may opt to represent their brand on Facebook for the majority of time, so for some, there is minimal switching. This is great, but does anyone know how to it on my iPhone? Unfortunately, the Pages app is limited in functionality. Hopefully that will improve over time.